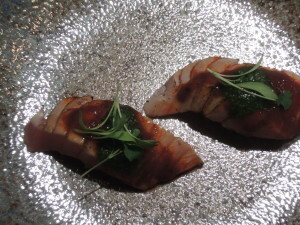 Last week I treated myself to dinner at o ya, as a late birthday gift. Eating at o ya is an experience. The restaurant entrance is marked by a small sign and tucked away to the building’s side. Walking through a heavy wooden door plunges patrons into a tranquil and ambient environment. Diners travel along a stone walkway to an anteroom housing the hostess stand. A rectangular dining area is located to the left of this room and laterally divided, with the back reserved for tables and a sushi bar in front. Sitting at the bar is the only way to go. The level of showmanship displayed by nimble sushi artists heightens the dining experience and helps create a one-of-a-kind atmosphere. 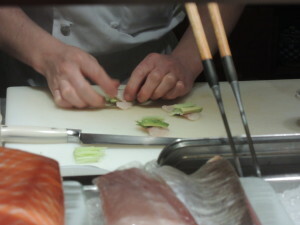 Each dish is painstakingly prepared by hand. Ingredients are sliced, torched, drizzled, and stacked to create the perfect plate. A persimmon salad with sesame tofu, spinach, and nori (dried seaweed). 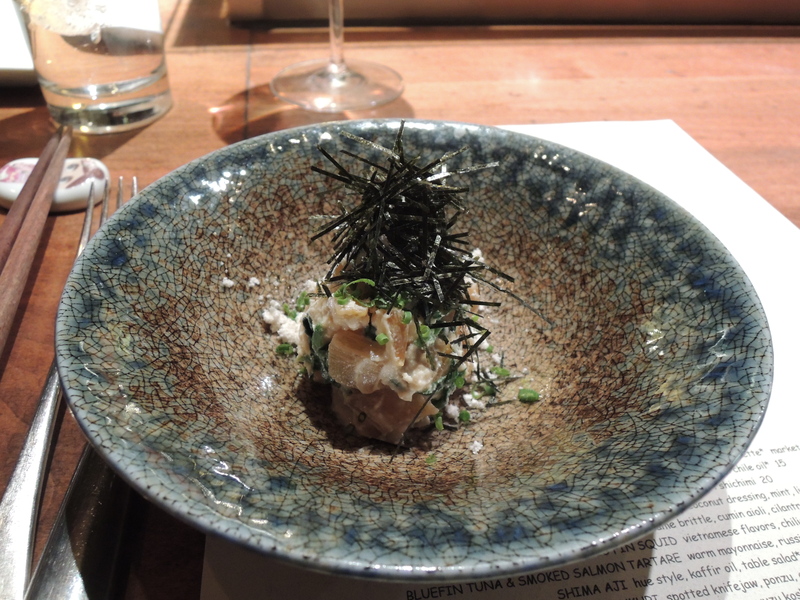 While visually stunning, this was not my favorite dish. The textures were very interesting, though. Fleshy persimmons paired with crunchy nori and creamy tofu dressing. Initially, the salad was incredibly refreshing and savory with a slight sweetness from the persimmon. After a few bites, the sesame tofu flavor became a little intense and slightly odd when paired with the fruit. I’m glad I tried it, but I wouldn’t order it again. #2 Next came one of the best Miso soups ($8) I have ever had. 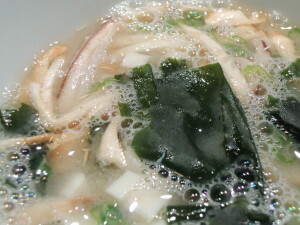 The o ya version includes shitake and hedgehog mushrooms which elevate this soup out of the realm of ordinary to amazing. Salty and earthy, but still light, this soup is perfect for a cold winter night. 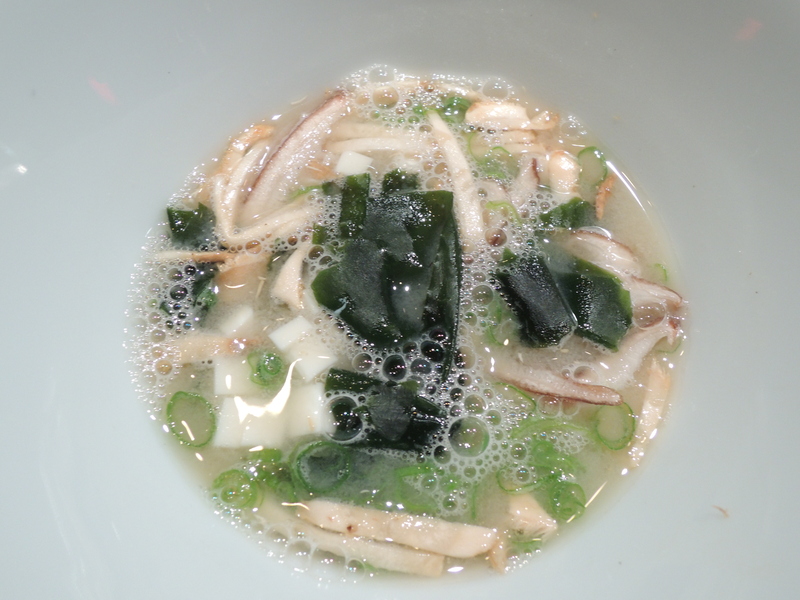 The mushrooms deepen the soup’s flavor and add a textural element. Their chewiness stood out from the soft tofu and crunchy scallions, adding a meaty quality to the dish. One of my favorite dishes, the flavors are fresh, clean and herbal. Sesame seeds sprinkled on top provide a bit of crunch. The herb sauce is the star of this dish. Including basil, tarragon, cilantro, apricot, and Chinese five spice, the complexity of this sauce perfectly accents the relative simplicity of the tuna. Clean but potent flavors make this perfect for repeat orders. 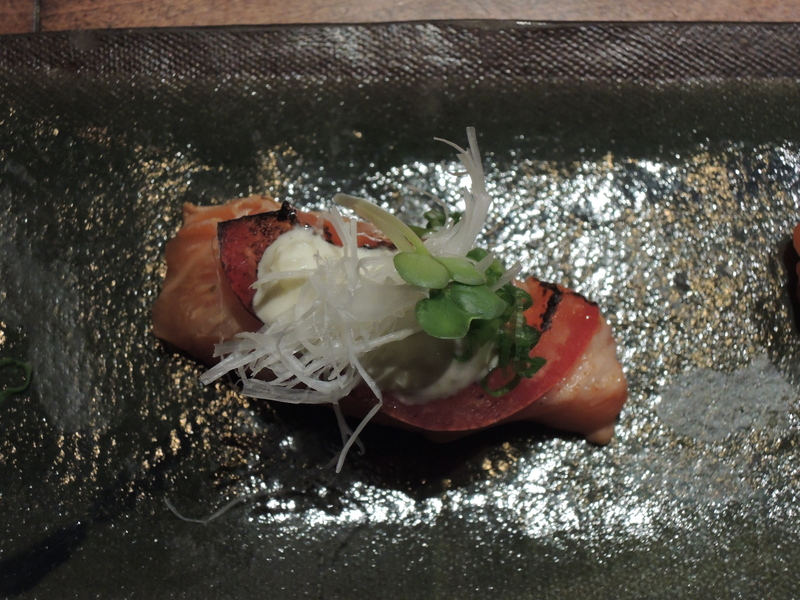 #4 Salmon tataki ($12) was an exciting menu selection. To any would-be pyros out there – take heart. This sushi is for you. Tomatoes are torched and top salmon slices with smoked salt, onion aioli, and negi (a Japanese scallion). 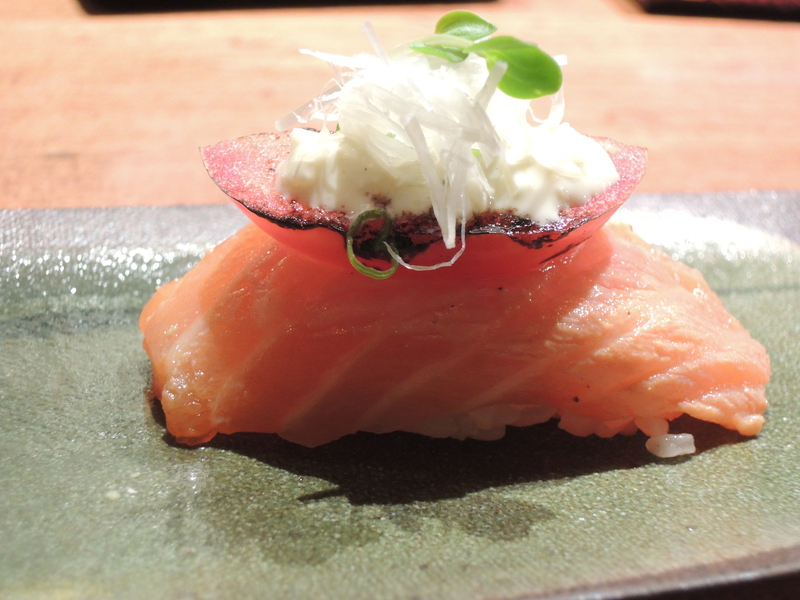 If you like salmon, this dish is a must order. It’s smoky, with a bright acidity from the tomato. Aioli adds a touch of sweetness and creaminess to the dish. 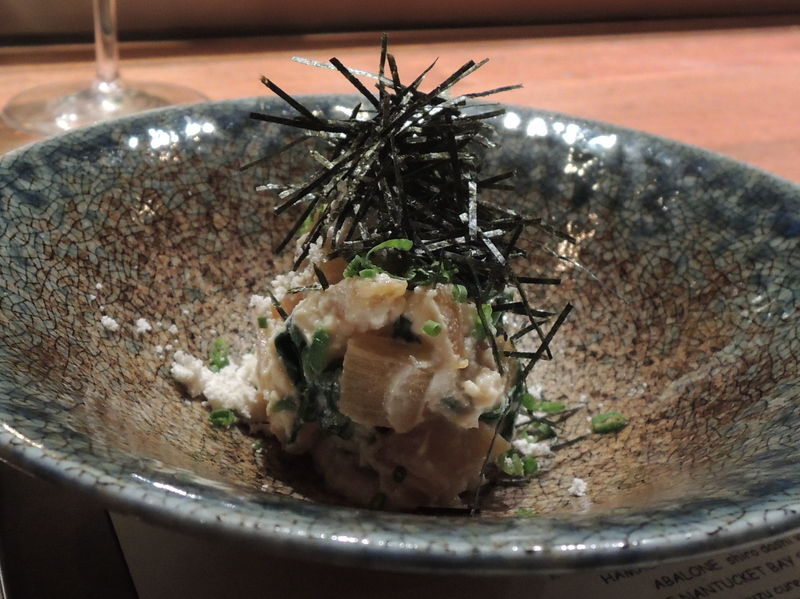 Topping it with negi is an excellent move. 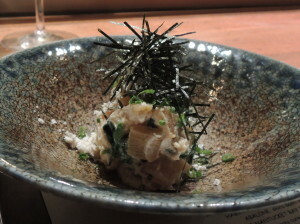 The onion adds a nice crunch, contrasting with the softer textures underneath. My only complaint was the difficulty I had fitting an entire piece into my mouth. 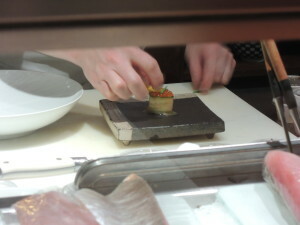 There is no delicate way to eat this – the stacking of ingredients really promotes an all or nothing approach. #5 Last but certainly not least, was the Peruvian style Bluefin chutoro tataki with an aji panca sauce and cilantro pesto ($18). What can I say? I love tuna. This may be the most beautiful item I ordered. 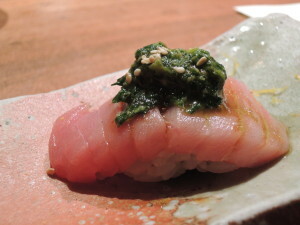 The bright orange aji panca sauce slides into the lines on the fish, complementing the deep green cilantro pesto. 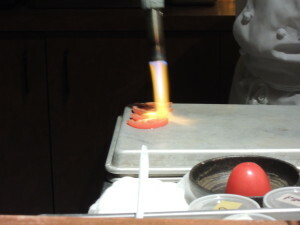 Taking a bite introduces an explosion of flavors. Spicy, fresh, and herbal there are hints of smoke and brine to this meaty fish dish. All of the fish dishes ordered were off the nigiri section of the menu and came with two pieces of fish, each atop a small bed of rice. While the rice flavor is typically overwhelmed by its fish and sauce toppings, the grain works well to help satiate an appetite. From previous experiences, I knew to skip desert. Fish is where o ya shines. 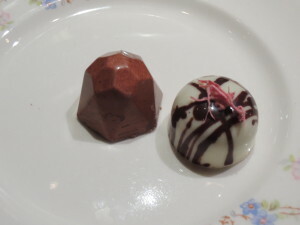 Deserts are not bad, but the two chocolate bonbons that accompany each meal sufficiently satisfy sweet cravings. A white chocolate bonbon contains matcha, Chambord, and salted cherry blossom. The green tea flavoring in this is a little overwhelming, but pairs nicely with the other ingredients and sweet white chocolate. A milk chocolate bonbon containing yuzu kosito and hazelnut, was perfection. Think Rocher with an Asian twist. Overall: a kickass dinner. Food is artfully prepared with delectable fresh ingredients. The price is steep. My dinner, including two glasses of wine and tip, ran about $130. This is not a restaurant you pop into for a quick bite. o ya is best reserved for celebrations, special occasions, or hedonistic revelry. In the end, you get what you pay for – and it is money well spent.